The accusative case relates to the direct object of a sentence. That is, the thing that is on the receiving end of the verb that the subject is doing. e.g. Gestern kaufte meine Katze einen Hamster. Yesterday my cat bought a hamster. The cat is engaged in the action of buying. Buying what? A hamster. Don't wonder why I am letting my cat buy small furry animals, this is just an exercise, okay? The accusative changes der to den, and ein to einen, i.e. it only effects masculine direct object nouns. So, as long as you only describe the actions against feminine, neuter and plural nouns then you don't need to learn the accusative. But given that the larger proportion of German nouns are masculine, this would be a bit restrictive. Der Hund küßt die Katze. 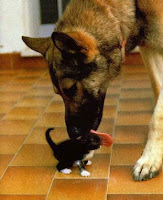 The dog is kissing the cat. Die Katze küßt den Hund. The cat is kissing the dog. And it still means that the dog is being kissed by the cat. Why would you do that? Well, to give emphasis to the dog being kissed, rather than das Pferd say. This looks like a useful and versatile bit of linguistics. However, it only applies to masculine nouns. If for instance you wanted to say Die Katze küßt die Schildkröte the cat is kissing the tortoise then you need to fall back on word order to indicate who is kissing whom. Why not go the whole hog like Latin to decline every part of a sentence to show its part, or give up altogether and let word order indicate the meaning, like English? Well, that's German for you. On the face of it well-ordered and logical, but not so when you get down to the detail. Then the durch part means der Wald becomes den, the accusative. Again, you can recast it to say den Wald, wanderten wir durch, to give emphasis to the wood, rather than the hills say. There are other prepositions that can take the accusative or dative depending on whether you're expressing motion or position, but we'll get to them later. When there is no preposition involved, and there is no reason to use any other case (e.g an einem schönen Tag on one fine day which uses the dative case) time expressions are useually put into the accusative. Ich war einen Tag in Berlin. I was in Berlin for a day. Ich las den ganzen Tag lang. I read all day long. Sie geht jeden Abend aus. She goes out every evening. Das Auto ist erst einen Monat alt. The car is only one month old. Diese Straße ist einen Kilometer lang. This road is a kilometre long. The personal pronouns change with the accusative. Er liebt sie. He loves her.